Here's another out of town couple -sort of, they are both in the Navy stationed in San Diego, but her family is here. So all of the planning and communicating was done via email and phone calls before hand. They did not see each other before the ceremony and again we had a bit of rain to deal with, but the clouds opened up enough for us to get some great outdoor shots and then a bit later just poored. 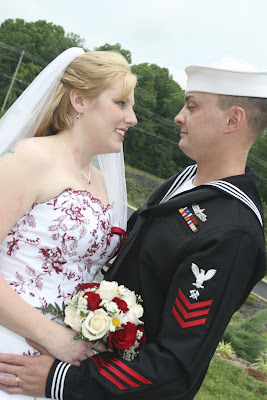 There was the ceremony and reception both on site at Middlebrook Gardens. I'll tell you I've never seen so many kids at a wedding, they were everywhere, just a wonderful occasion anyways, but the kids were so cute and having fun too!